The piece contains a large sculpture of a lion and the figure of Isaiah as a small boy. The piece is made from sandstone. The eyes were orginally made from glass taxidermy eyes, however now are replaced with plexiglass eyes. The piece was made with the intension of ornamenting the Chagrin Falls village square. The sculpture currently is on long term loan at the Cleveland Museum of Art. 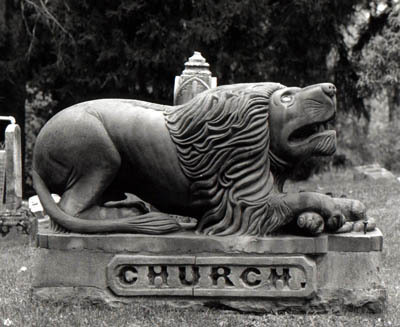 : “Young Lion and Fatling Together,” Ohio Outdoor Sculpture Inventory, accessed April 20, 2019, http://oosi.sculpturecenter.org/items/show/945.